This 1963 Chevrolet Impala SS is gorgeous; it has the looks, the power and the sound. If you are at a gas station or car show get your mace ready because a crowd will form! The body is very nice with minimal blemishes, and the interior is tastefully done. It is powered by a healthy 350ci motor. It is lowered and has a firm feel. The stereo sounds excellent and the Vintage Air blows cold. The inside of the car is in excellent condition All of the glass goes up and down with ease. If you are looking custom Impala SS this is it. Please take a moment to watch our video as you will enjoy the walk around. The red on black looks excellent and has no major imperfections. The dash and all door cards are in very nice condition. The exterior shows very well, the rich black paint is even and shines with good reflection throughout. All of the trim and bright work shows very well. There are no foul odors in this vehicle. All of the interior gauges and lights work as they should. 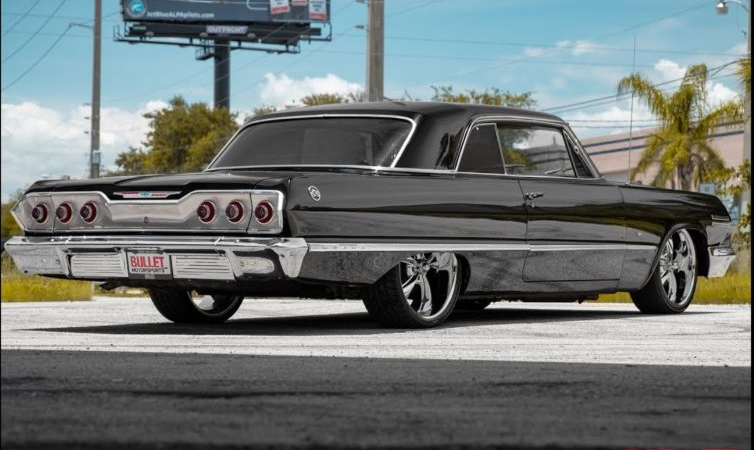 You are jumping back in time when you sit inside of this gorgeous Impala! The Wheel setup consists of 20inch wheels in the front and a matching 22inch wheel in the rear. This car looks sinister going down the road. Paint is a 7.5 out of 10. Powered by a smooth running 350ci, she cranks up on the first try after a single pump to the pedal. The transmission shifts smoothly throughout the gears. If you are looking for a headache free cruiser look no further. The motor has plenty of power and breathes freely through a set of headers. Take a look at our video and you will fall in love.